Our friends at @Xi Computer loaned us monster i9 machine that we used to compare against the AMD Threadripper (TR). It wasn’t a totally fair comparison in that the i9 7900x only has ten 3.3 GHz cores, and the AMD TR has 16, 3.7 GHz cores. But don’t jump to conclusions, the results are not as predictable as you might suspect. We ran four sets of tests, TR with an EVGA GTX 1080Ti, TR with Radeon Vega 64, i9 with GTX, and i9 with Vega. We ran Firestrike Ultra and Extreme, TimeSpy, Ashes of the Singularity: Escalation, Extreme and High, Tomb Raider, Deus EX, PC Mark 10, Passmark, and GeekBench 4. All in all, 136 tests, at 2560 × 1440, on a 27-in Asus Freesynch monitor. But we’re not going to publish a 136 score (plus labels) table, so we scratched our heads trying to figure out what would be relevant. Using Passmark, the overall score for the TR vs. the i9 with a Vega favored the i9 by 31%, and with a GTX, it was 47%. OK, assume graphics performance was involved. But in the CPU only test, we saw no difference due to the AIB, which verifies the “CPU only’ness” of the test. We saw similar results on the CPU tests of Ashes of the Singularity CPU scores, averaging negative 57% for Vega, and 54% for GTX suggesting there is some GPU influence in the CPU tests. 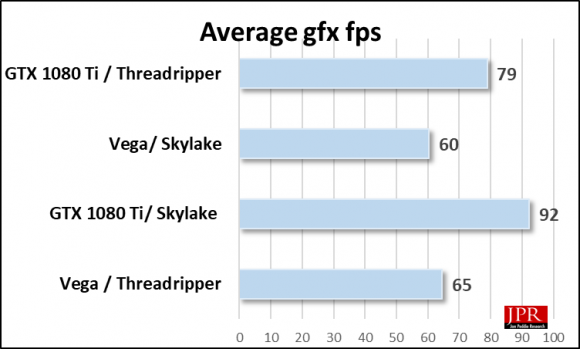 In the graphics performance tests, the Nvidia GTX 1080Ti on either platform beat the AMD Radeon Vega 64, and more so on the i9 system than the TreadRipper, as shown in the following chart. So the added cores of the TR couldn’t compensate for the higher performance of the GPU. A GTX 1080ti is not a fair match to a Vega. 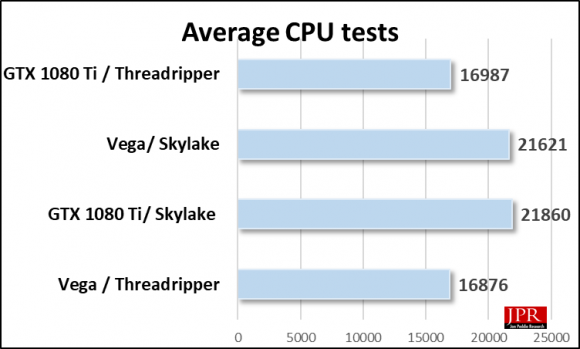 However, notice that the difference between the Vega on TR to i9 is slight—just 4%. This indicates to us that AMD’s statement about the TR being matched to Vega is correct. The detail of the test results is shown in the following chart. The difference of the of the Vega on TR vs the new i9 is 7%, given that the i9 is the more powerful processor this small variance might seem surprising, however AMD was very successful in harmonizing the performance of the Vega and TR together, making up for the lack of pure processor power. The PCs had the following characteristics. What do we think? It’s difficult to use general purpose tests to evaluate a device or product because the most fitting combination of components depends heavily on the user's workloads—there's not a single point of balance that's ideal for everyone. TR offers a strong combination of per-thread performance and multithreaded capability, so it's really good for gaming (usually gated by per-thread perf) and professional content creation (where more threads can help). RX Vega 64 is great for high-res/high-refresh gaming, too, so TR plus Vega is a nicely balanced combination.